With the much anticipated 2016 Euros Quarter-Final meeting between the Germans and Italians set to kick-off in just a couple of hours, we take a look at the last three meetings between the two nations either in a FIFA World Cup or UEFA Euro setting. A 0-0 draw is usually seen as a dull affair in the world of football, but this was not the case on the 19th of June at Manchester United's Old Trafford in 1996. 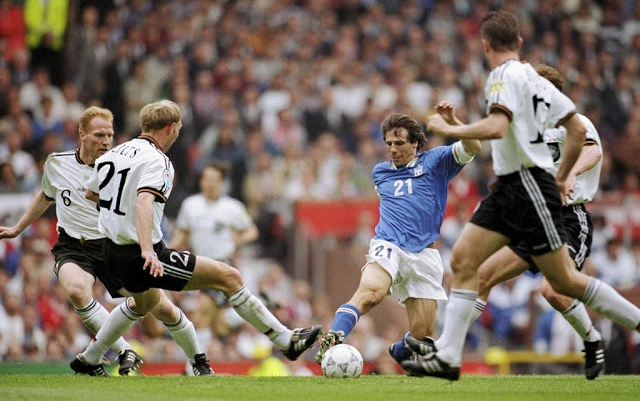 Leading up to England 1996 Italy and Germany were both drawn into Group C alongside Russia and Czech Republic. The two met in their final group stage match with the Germans needing a draw to advance to the next stage, while Italy was tied on points but with a lesser goal differential than that of Czech Republic. Despite a red card handed to German midfielder Thomas Strunz in the 59th minute and a penalty-kick awarded in favour of Italy in the match, the Italians were unable to take advantage of their numerical advantage on the pitch and with a missed shot from the spot a 0-0 draw would send the Italians crashing out of the tournament as the Czechs drew Russia with a 3-3 final scoreline. The Germans would go on to win the Euros, defeating group mates Czech Republic in the final match. 10 years after their meeting in England, Germany and Italy were going head-to-head once more, only this time on German soil. But in 2006 home advantage proved to be useless for the Germans as they faced Italy in one of the two semi-final matches, with the Italians going on to not only defeat the home nation, but would capture the World Cup title altogether. In a match that again finished with a 0-0 scoreline after the initial 90 minutes despite quite a few scoring chances for both sides, the hosts were headed to extra-time, hoping to book a place in the final. But the Italians had a different idea, and after watching West Germany claim the World Cup title in Italy in 1990, managed to score twice in extra-time sending the Germans out of the tournament and eventually claiming the title on German ground. The last meeting between the two in a major tournament was at a semi-final stage once again, and once more, the Italians came out victorious. Mario Balotelli was the hero on the day, scoring twice in the first half, which would prove to be enough for the Azzurri to move on. A late penalty-kick goal from Mesut Özil would be in vain while the Italians would go on to a bitter 4-0 defeat to Spain in the tournament final.